Is Tap Water Safe to Drink in London and the UK? 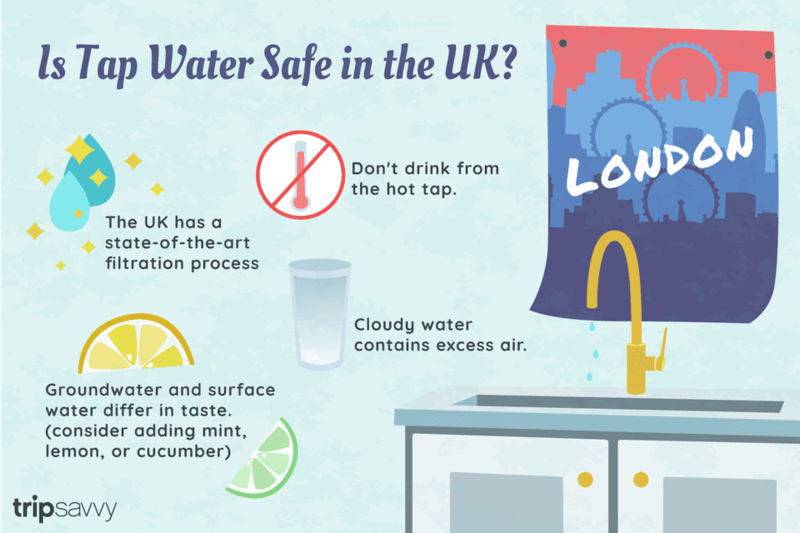 Many first-time travelers to the UK want to know whether the tap water there is safe to drink; after all, there's nothing like a stomach bug to put a downer on your vacation. The short answer is yes—all mains tap water in the UK and Ireland is safe. This will come as a relief to those traveling on a budget, since bottled water is charged at a premium, especially in London. Filling up your water bottle from the tap is an easy way to cut costs. British tap water is not only safe, but it's also ranked as some of the cleanest in the world (yes, ahead of the United States!). In 1897, the town of Maidstone in Kent was the first in the world to have its entire water system treated with chlorine as a preventative measure against waterborne epidemics such as typhoid, cholera, and dysentery. Today, 94% of British citizens report that they are satisfied with their main water supply, and in blind taste tests, many people are unable to tell the difference between tap water and bottled water. In fact, English newspaper The Telegraph published an article in 2013 stating that bottled water may not be as safe as tap water because it isn't subjected to the same stringent testing. Every year, millions of tests are carried out to ensure that Britain's mains water adheres to standards informed by scientific research from the World Health Organization. In 2014, results showed a 99.96% compliance rate in England, a 99.98% compliance rate in Scotland and a 99.86% compliance rate in Northern Ireland. 68% of the UK's tap water comes from surface water sources including reservoirs, lakes, and rivers. The rest comes from underground springs and aquifers. Whether you'll be drinking surface water or groundwater depends largely on which area of the UK you plan on visiting. Generally, tap water in western Ireland and the southeast of England (including London) comes from groundwater sources, while tap water in the Midlands, northern England, most of Wales, Scotland and Cornwall comes from surface water sources. Groundwater is naturally laden with more minerals than surface water, giving it a "hard" taste that can take a while for some visitors to get used to. In comparison, the softer water typically found further north is often lauded for its pure taste, which some attribute to the UK's notoriously soggy climate. Frequent rainfall constantly replenishes the country's lakes and reservoirs, so that water is never allowed to stagnate. The filtration process differs slightly for groundwater and surface water, with several additional steps required for the latter due to the fact that it is naturally exposed to more environmental contaminants. At the treatment plant, surface water is usually kept for many days in an open storage reservoir so that solid contaminants can settle to the bottom. Sunlight also helps to break down organic materials and bacteria. Eventually, it is filtered through metal grills to remove floating objects, such as leaves. Thereafter, the process is the same for both types of water. A chemical coagulant is added to allow silt particles to clog together, making them easier to remove via filtration. Next, the water is aerated to remove unwanted gases (like carbon dioxide and hydrogen sulphide), before being passed through a Granular Activated Carbon (GAC) vessel. This device contains porous carbon particles that absorb organic compounds from the water to improve its clarity. Finally, the water is injected with ozone to break down pesticides, then treated with chlorine to kill any remaining bacteria. It can take anywhere from a couple of hours to several days for the water to travel from the plant to your tap. If it has a long journey ahead of it the water is treated with ammonia, which reacts with the chlorine to create a longer-lasting disinfectant. Although all mains water is safe to drink in the UK, there are a few points to remember before you fill your glass. The Drinking Water Inspectorate (DWI) advises that it's best to avoid drinking from the hot tap, because hot taps are usually connected to a storage tank or heater rather than directly to the mains and the water may not be as fresh. In rare cases, cold water taps may be connected to a private water source or rain tank. Usually, hotels and public venues will mark these taps with a "non-drinking water" sign so that you know to fill your water bottle elsewhere. Occasionally, water appears cloudy when it first comes out of the tap. This is caused by excess air, and the water should soon clear if you leave it to stand for a minute or two. If you're traveling to London or another southern town (like Oxford or Bath), you may find that the taste of hard water isn't to your liking. Instead of forking out for expensive bottled water, consider adding mint, cucumber or lemon to alter the taste. Similarly, chilling your tap water erases the slight aftertaste of chlorine that is sometimes left over from the treatment process.